This never happens to me - usually when I love a book I love it straight off the bat. I also usually never hate a popular, bestselling book - not always in love with it, but usually never hate it. I consider my tastes fairly normal. I couldn't stand it for the first 50 pages or so, and seriously considered putting it down. (THIS NEVER HAPPENS) Because I'm crazy about not DNFing, I continued. Boy am I happy. 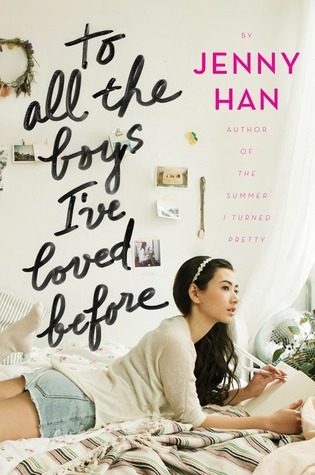 From the second Lara Jean jumps on Kavinsky and I looked up from the book in bewilderment like did she just do that things took a turn for the awesomeness. I loved how funny things were, I love how I grew to care. I hurt for Josh, I hurt for the sisters. I liked how normal and boring our protagonist was, but how her story and life was beautiful and meaning to me nonetheless. I liked how she was Asian, and it was addressed - ahhahh I had never thought about the costumes thing. The romance was beautiful. It was slow, it was funny, it was natural. He grew on me, Peter. Totally had me in love with him by the end. My only real point of criticism throughout the novel was that Lara didn't dwell pretty much at all on who sent her letters. I felt that anyone else wouldn't rest until they found out who had done it. As for the person who had done it... without spoilers, I felt that that was a drastic move, and frankly an unforgiveable one. Not to mention the cause of Lara and Margo's fallout... the Song girls' ability to forgive each other was truly astonishing.